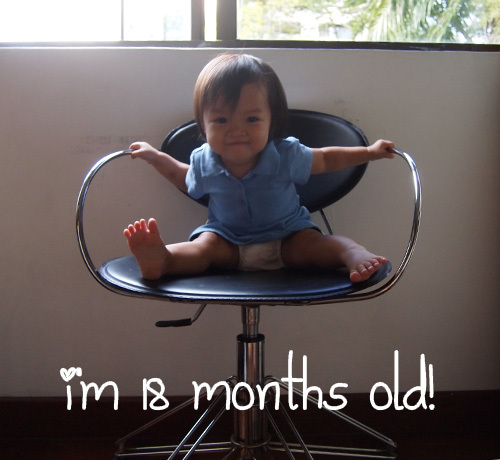 Hello Little Sunshine - Singapore Parenting and Lifestyle Blog: Kaitlin is 18 months old! Kaitlin is 18 months old! We've been really busy the past couple of days, but I'm happy to finally be able to share that MY BABYGIRL IS NOW ONE AND A HALF YEARS OLD! :D She officially turned 18 months old on Sunday, but our days were quite busy so I didn't get a chance to take pictures and blog, but better late than never! We gave the babygirl a tiny treat on Sunday. Brought her to Go Go Bambini to have some fun! She didn't really want to play at first and the other kids were probably quite intimidating to her cos they were all running and screaming. She eventually warmed up and had lots of fun so that was great! I also brought Kaitlin to the doc's for her jabs (two jabs at a go and no fever at all, this girl is a trooper!) on Monday, and the doc pointed out that she's on the smaller side, meaning that she's petite and not that she has a weight issue. Finally feeling quite relieved. We haven't been visiting the docs, which is a good thing so I was glad to finally be able to get a confirmation that she's doing alright. This month's pictures were taken when she was 18 months and 3 days old. That also kind of means that we've been parents for that long as well! How did we do it and still remain sane?! Life with Kaitlin the past one and half years has been nothing short of amazing. As I always say, sure there are bad days..days you wanna just scream and chop off every single person's head, days you ask yourself why and question your ability, days you just wish you could collapse and just take nap but can't..but it's all worth it! I'm not a perfect mom. I do get impatient, angry and upset. Neither is my daughter perfect. She has her tantrums and meltdowns, and of course her daily dose of being mischievous. But hey, she's the best thing that has ever happened to me (well besides the husband of course!)! She's still a fussy eater. Still breastfeeding, and still waking up in the middle of the night to latch on. I know, I know, yes she is 18 months old and still breastfeeding. If you've got something nasty to say, I suggest you not say it. Everyone has their own way of doing things, so we would appreciate it if you kept your thoughts and comments to yourself. She can get really hyper. Kaitlin loves to lean back and fall backwards when she's on the bed. So much so that sometimes when she plays, she attempts to do it and we've to catch her if not she would be hitting her head. I like how she is starting to bring her storybook to bed even after we've read it, just to open and look for a few seconds. Sometimes she is looking at it upside down, but better than not doing it at all. Babygirl can sort of skip. Sometimes she likes to walk funny just for fun. She is also starting to run quite fast. She seems to understand us more now. Kaitlin is also starting to being a little more open, and not so wary of strangers. She also likes dogs. She likes to go quite close to them, but any nearer and she will get scared, but in an excited manner. Babygirl is able to get on and off small chairs without assistance. She is able to throw and kick balls. Likes to play pretend, like feed the pony or play masak masak. Babygirl is about to start school soon in about slight more than a week's time. Hope all of that goes well.